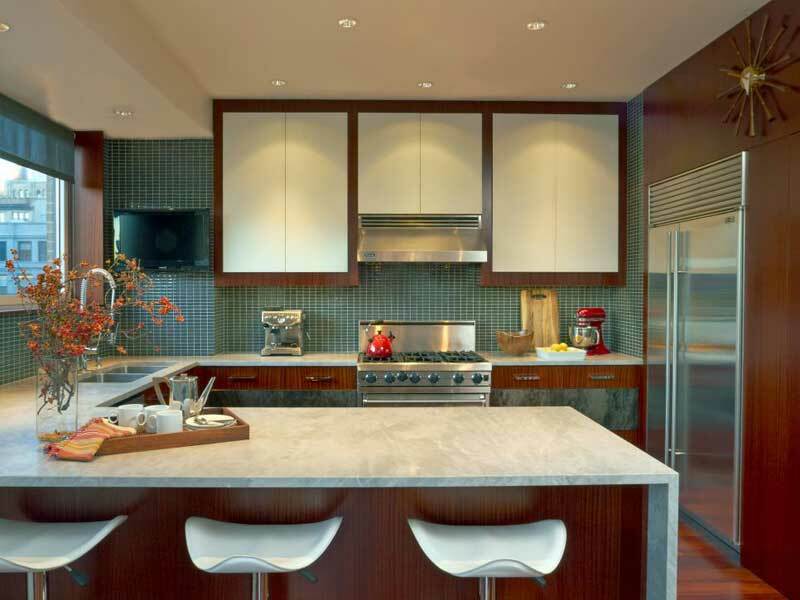 In this article, you will find 43 kitchen countertops design ideas of the best interior designers in the world. The kitchen is not just a part of your home reserved for cooking and eating. We in a way live in our kitchen as it is also a place where all of the actions in the house take place, that’s why we can say it is a real heart of the home. 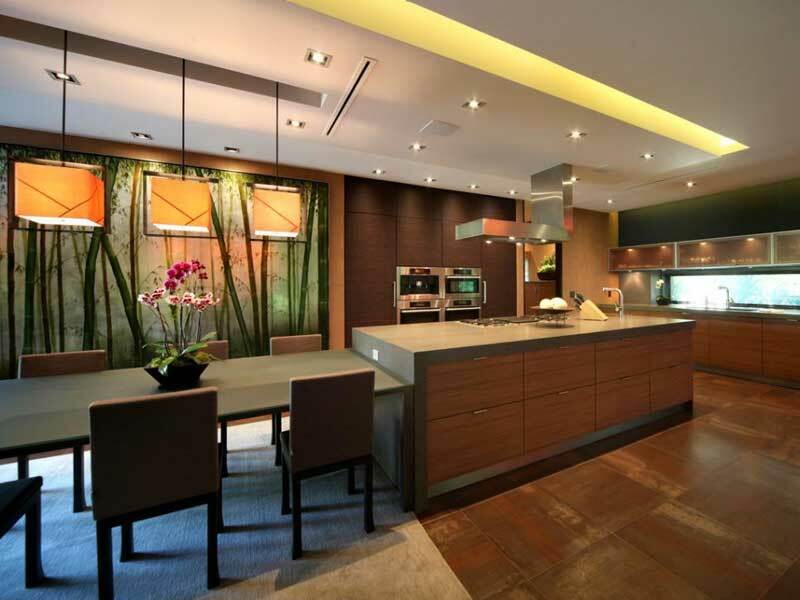 The kitchen design is a significant part of a working interior. The most important part when furnishing or redecorating is to adapt the new interior to your lifestyle. These practical and easy-to-steal decorative touches will surely inspire you whether you live in a stately home, a city flat or a tiny ancient cottage, and will help you make your kitchen a pleasant part of your home. 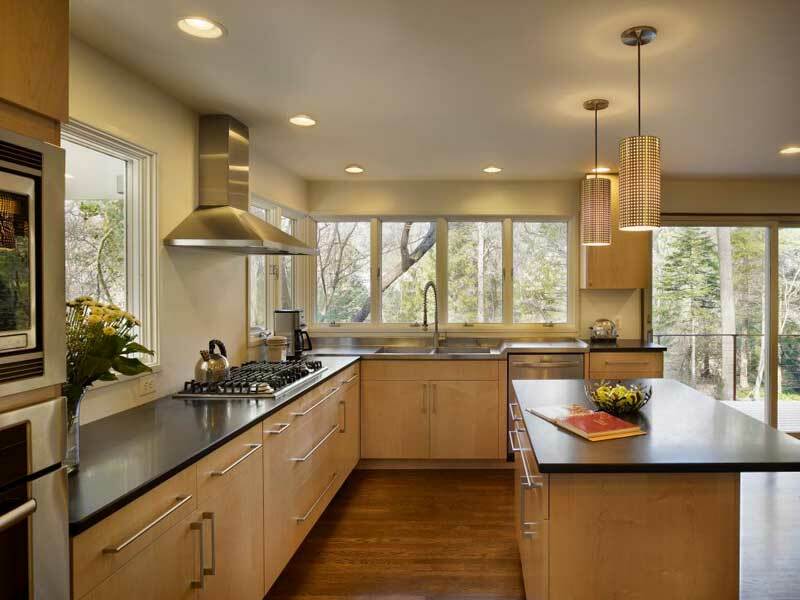 Modern kitchen design is usually linear, angular and determinedly simple. 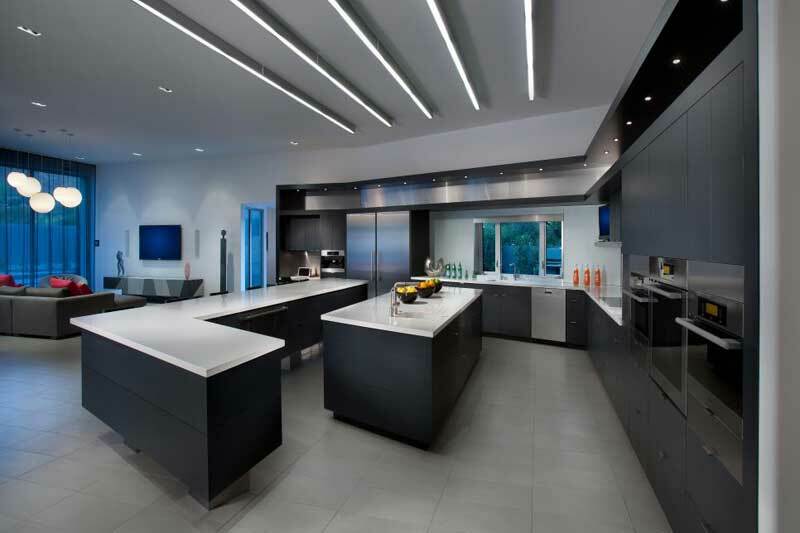 This example of open plan kitchen represents the dramatic side to modern design. 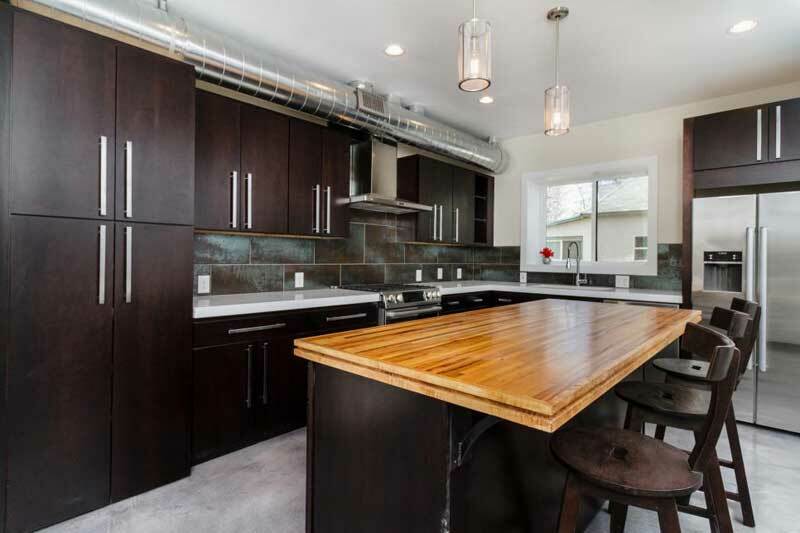 Consisting of black laminate cabinetry and stainless steel appliances, the kitchen is well combined with the lighting arrangement and long, angular countertops and other linear elements in the room, giving this part of a home a lean, industrial and high-tech look. There was an unwritten rule with the old standard kitchen countertops design that all the surfaces in the kitchen must match (perimeter counters, island and everything in between). But today is different, and as these stunning kitchens go to show, mismatching is allowed, and it looks excellent. 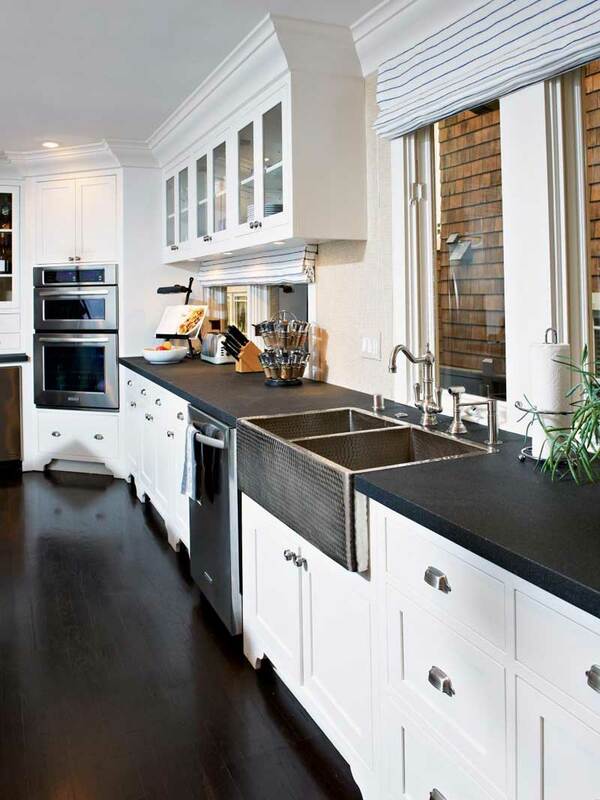 This type of high-end kitchen has a bit of sophistication from black countertops paired with white cabinets. The designer thought of everything as the floor has its share of chic with an inlaid silver graphic pattern. 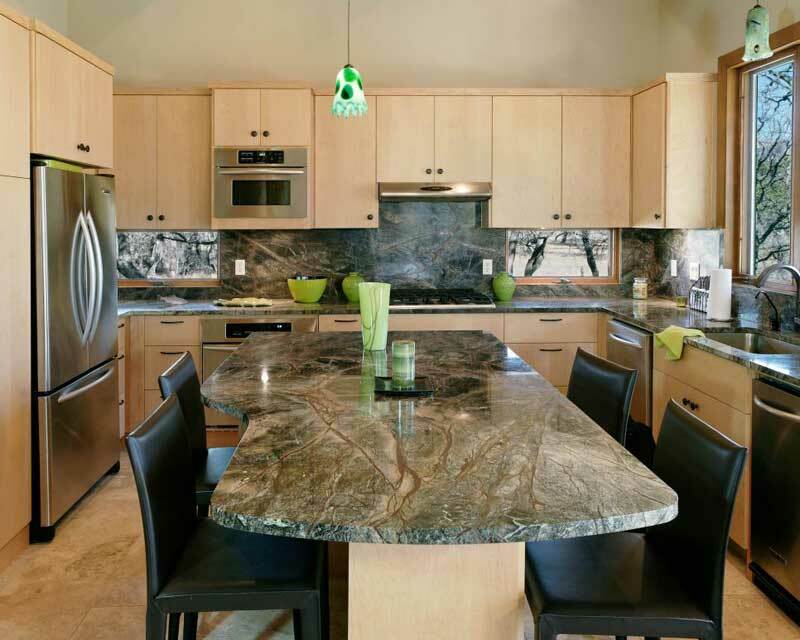 If you like making a contrast, you should consider this beautiful idea with granite countertops. The black granite provides contrast against the light wood cabinets and neutral tile backsplash in this updated kitchen. What gives a life to this place are the vases with fresh-cut flowers. 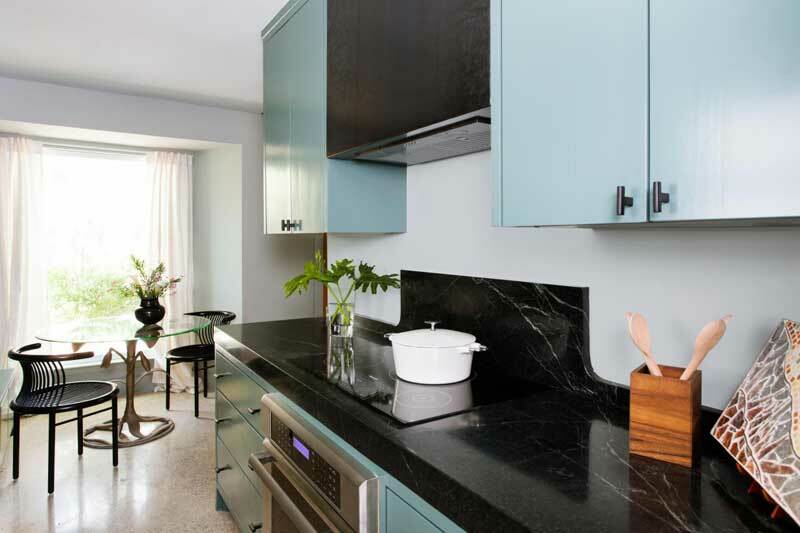 With the combination of shaker cabinets and black marble countertops, you can make a kitchen that is both chic and timeless. A shimmery copper backsplash adds a unique element to the design, and the pop of red accessories bring a fun energy to space. 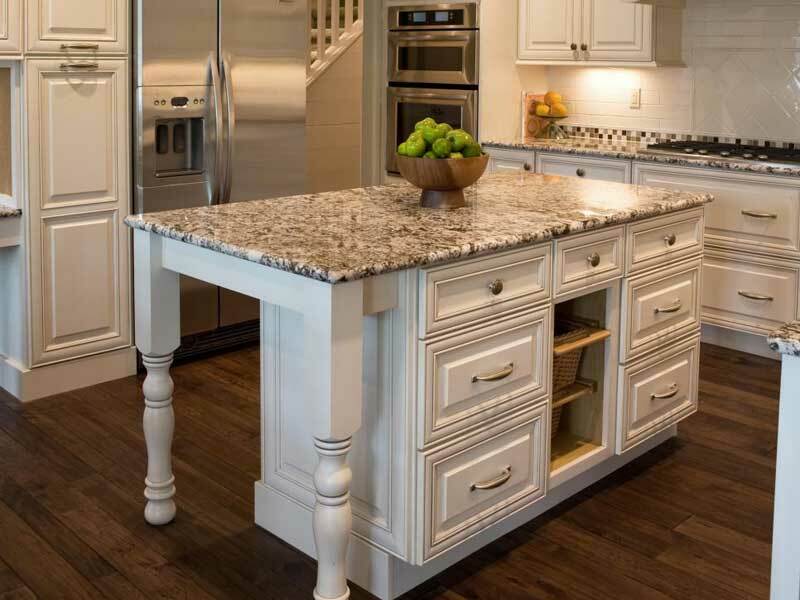 A large island offers ample space for prep and storage. The primary goal when designing this modern kitchen was to make a mix of the ones tones with the desired neutral tones that would open the space. The goal is achieved successfully by adding new backsplash tile and quartz countertops. 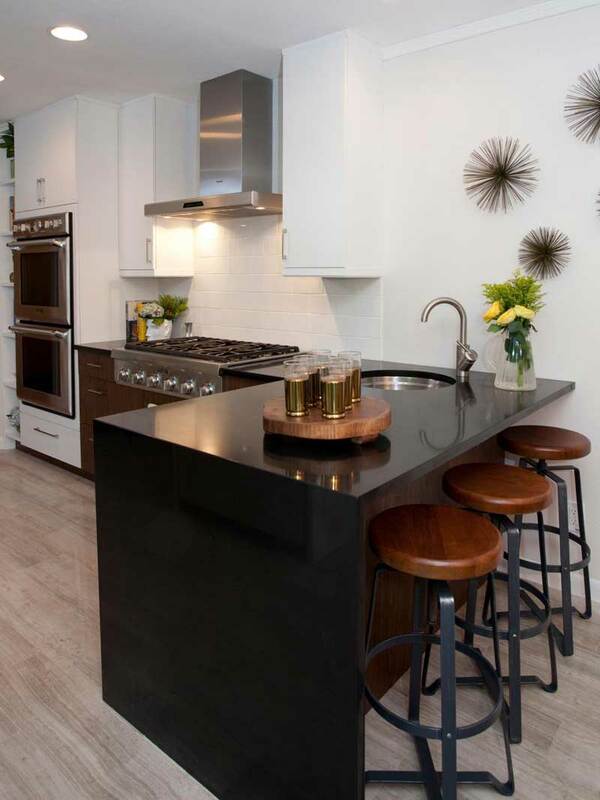 This kitchen design containing black quartz countertop and wood barstools compliment the unusual angles of the space. A sleek look effect is provided with a black quartz waterfall countertop and three barstools with wooden seats and metal bases that give a bit of rural feel to this modern piece of home. 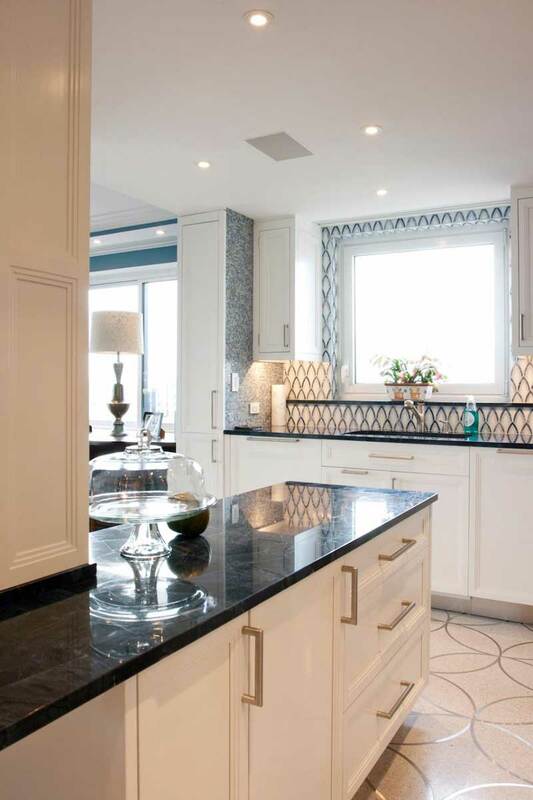 This sophisticated color mix is achieved using black soapstone countertops and muted light blue cabinets. A couple of stylish, black dining chairs expand this color combination into the breakfast area. You have in front of you a typical Mediterranean, Mexican kitchen style. 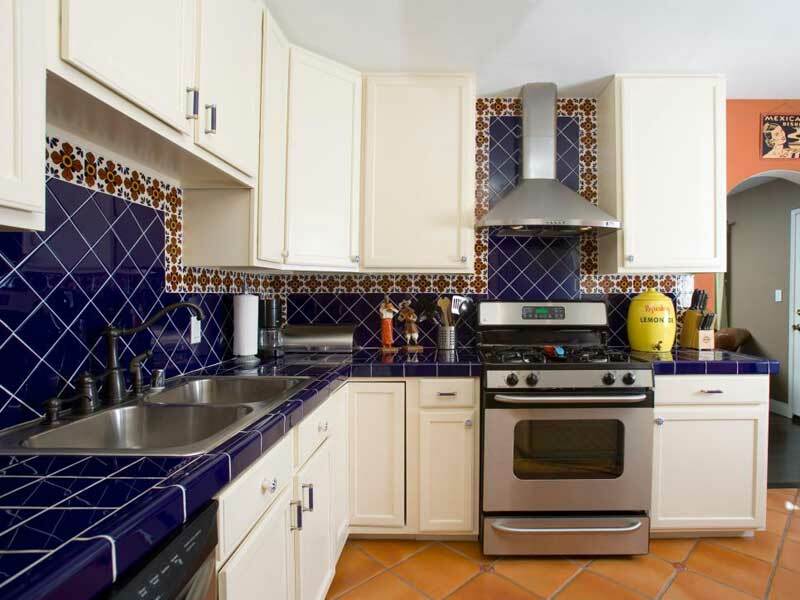 This kitchen design is made combining white kitchen features with inspired blue tile countertops that extend into the backsplash combined with yellow and orange patterned accent tiles. There is a simple trick that will be the better solution for you than remodeling the whole kitchen. 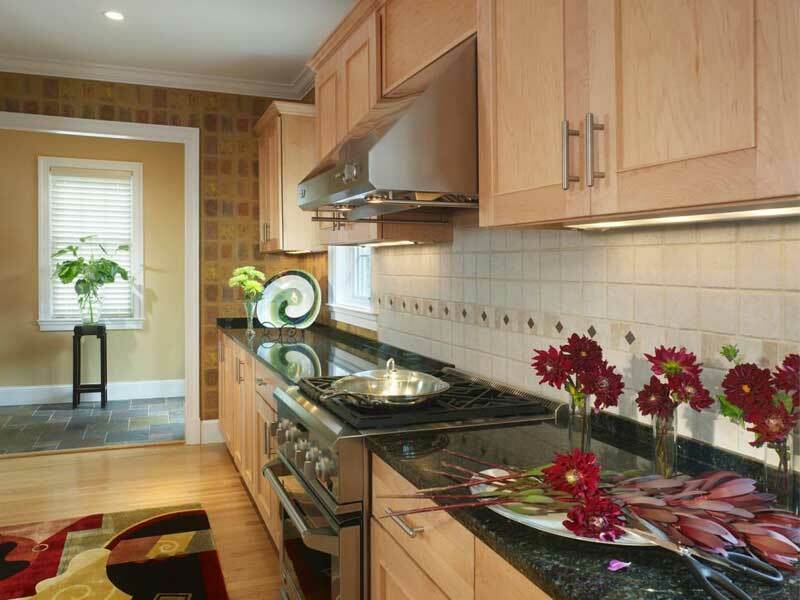 All you have to do is refurbish the kitchen countertops design to add a dramatic sweep of color. 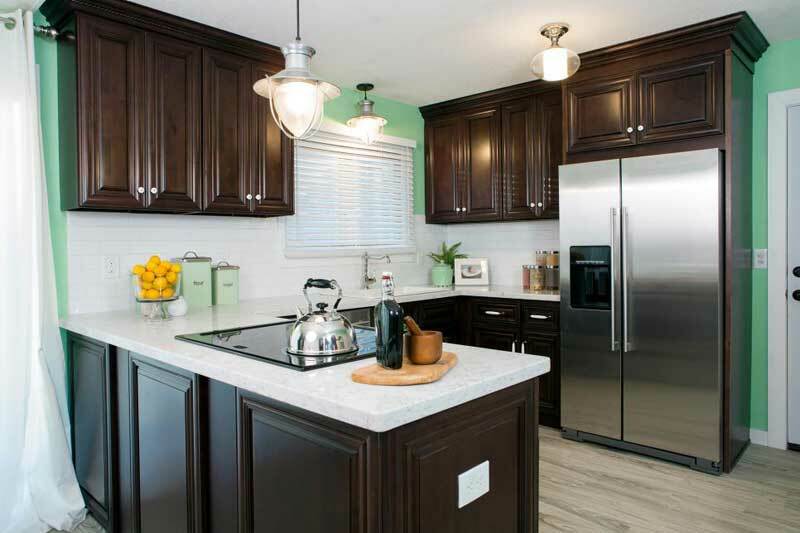 This combination of elements and colors makes this kitchen model neutral but pleasant at the same time. 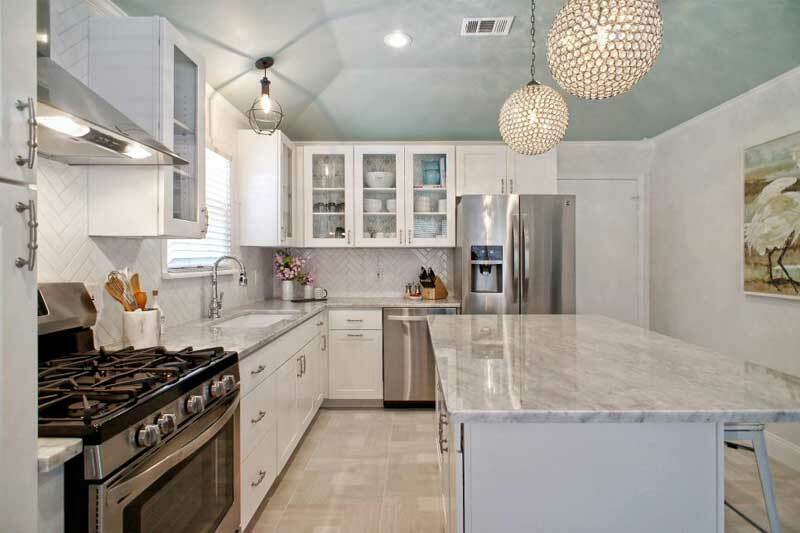 With the array of cabinets, this white transitional kitchen can give a lot of storage, and also extra elbow room around the prep sink provided by the island. Having the island’s butcher-block countertop, you gain an excellent preparatory space in this type of open concept kitchen. 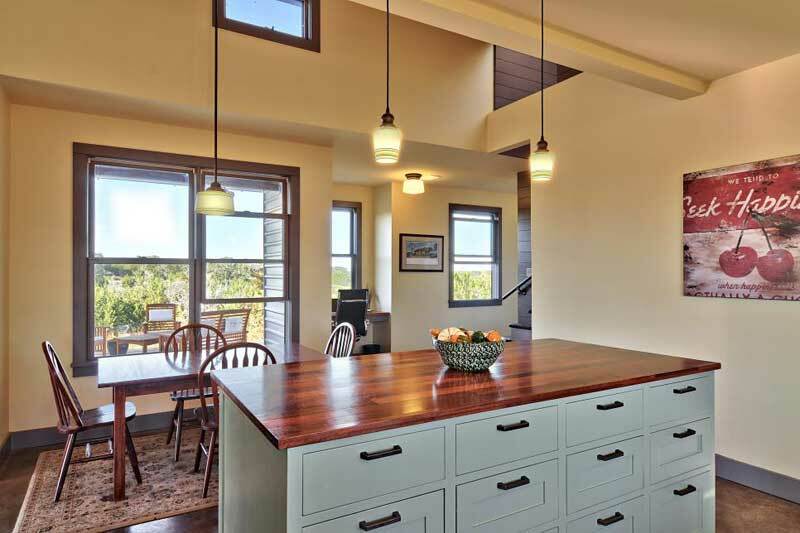 This U-shaped kitchen option contains medium grain cabinets and an exposed beam ceiling. The Industrial feel is the result of the concrete countertops. 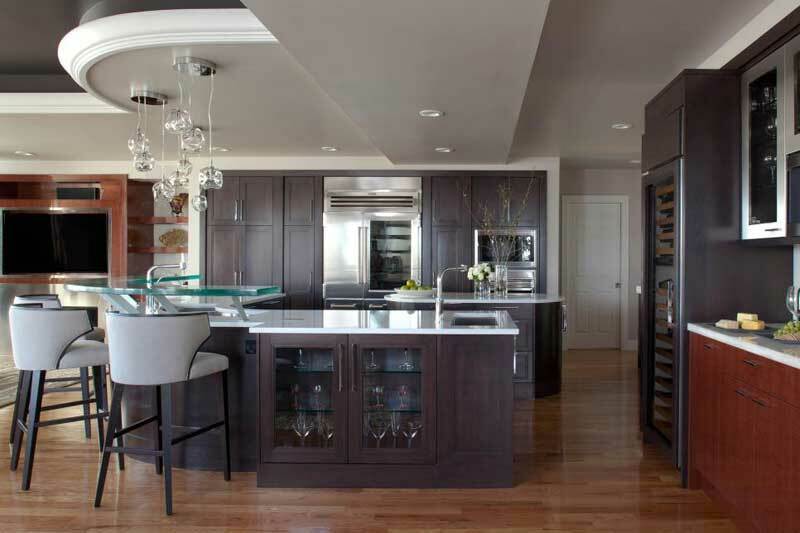 On the other hand, a peninsula can provide extra room for food preparation and cabinet storage. What makes this kitchen very unique is the beautiful island. 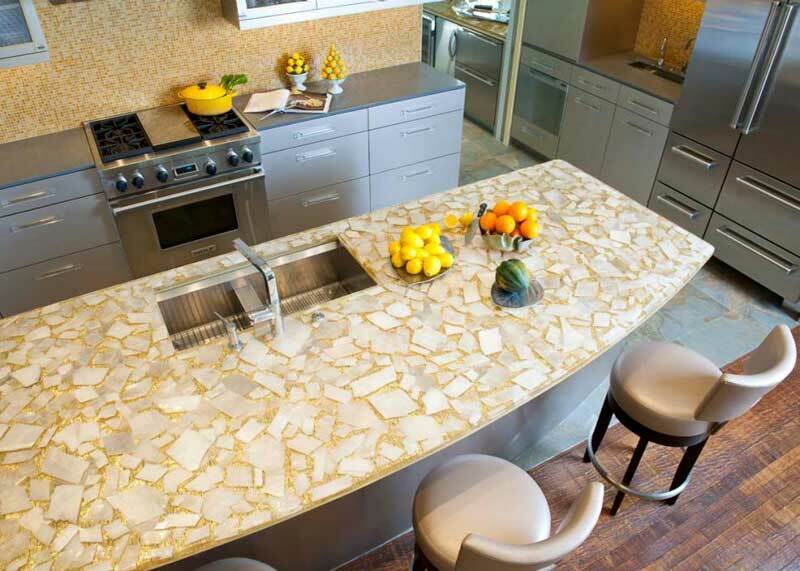 The beauty of the island came from the high-density resin with gold fabric background and chunks of white selenite crystals integrated into this kitchen countertop and smoothed out for a nice finish to the preparatory space. The adjustments of the cabinetry make the room flow nicely and provide you the open concept at the same time. 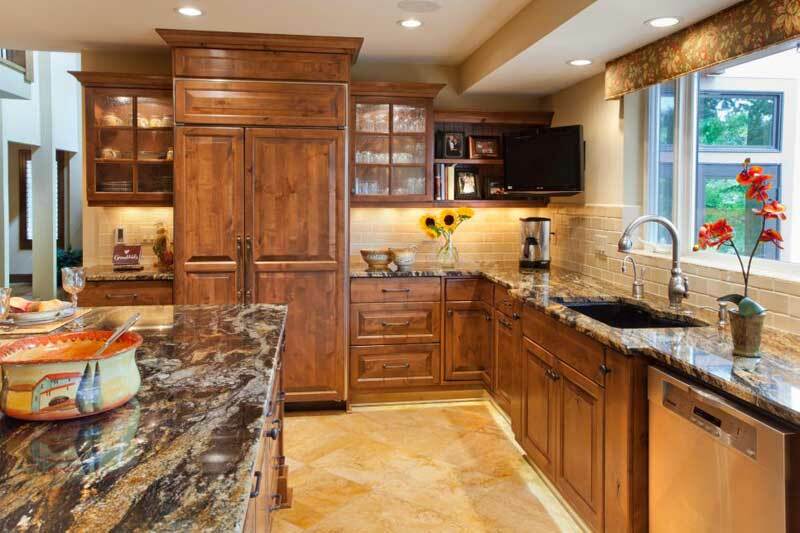 What makes this kitchen model different, is definitely the wood paneled refrigerator that matches the cabinetry and blends wonderfully into the natural look of the room. Thanks to the glass cabinet doors, you can flatter your organized glassware and dishes. The room gains a fresh, pleasant look with these beautiful dark stone countertops, and the light stone floors as a neutral foundation. Refreshing light green kitchen island covered with dark wood countertop and rows of drawers that provide a lot of space for kitchen utensils and other essentials. For those who’d enjoy eating in this country-style kitchen, this option with a casual dining area overlooking the Texan landscape is definitely a right decision. For those who like a clubhouse feeling while preparing meals or eating, this kitchen design is the right thing. The ambient is made combining a dark cabinetry with sleek, modern touches, like an elevated glass countertop making the kitchen glamorous. 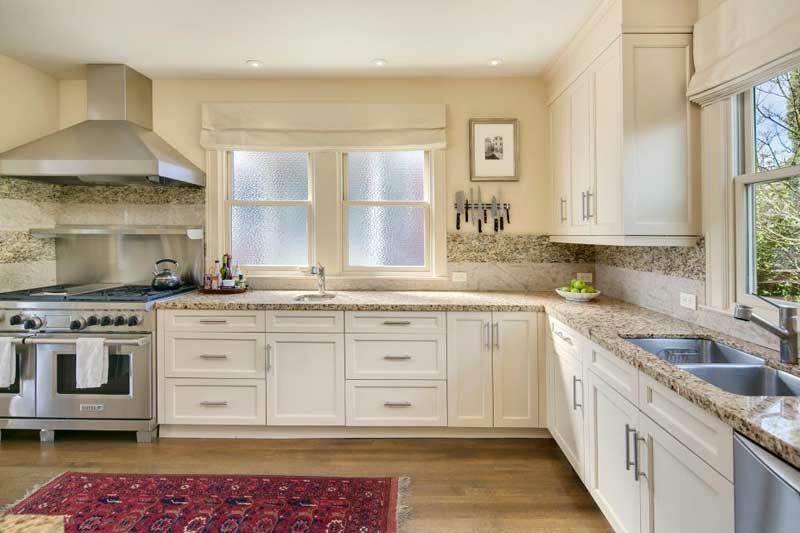 Oh, what a pleasant, airy feel when looking at this beautiful transitional kitchen with bright white cabinetry! The stylish look is achieved with a glossy black countertop which lines the perimeter of the kitchen and gives it the eye-catching contrast. A mix of rustical and modern design kitchen? Hm, looks good! 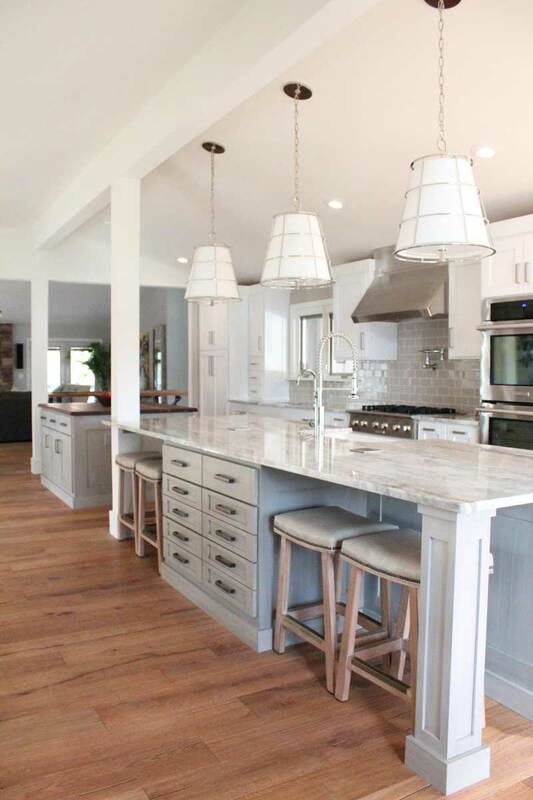 This simple but nice modern cottage ambient is achieved by highlighting the kitchen island and the combination of beautiful classic white cabinets with lighting fixtures. You like a lot, a lot of brightness? 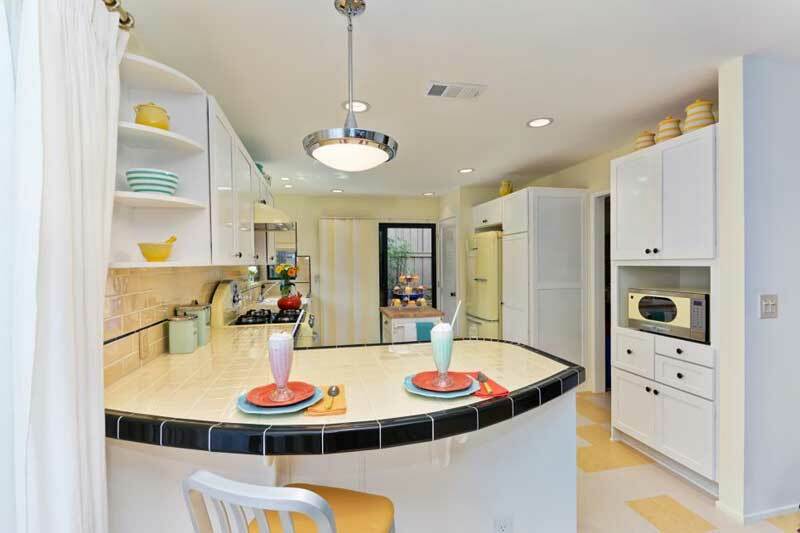 Take a look at this light and bright kitchen. 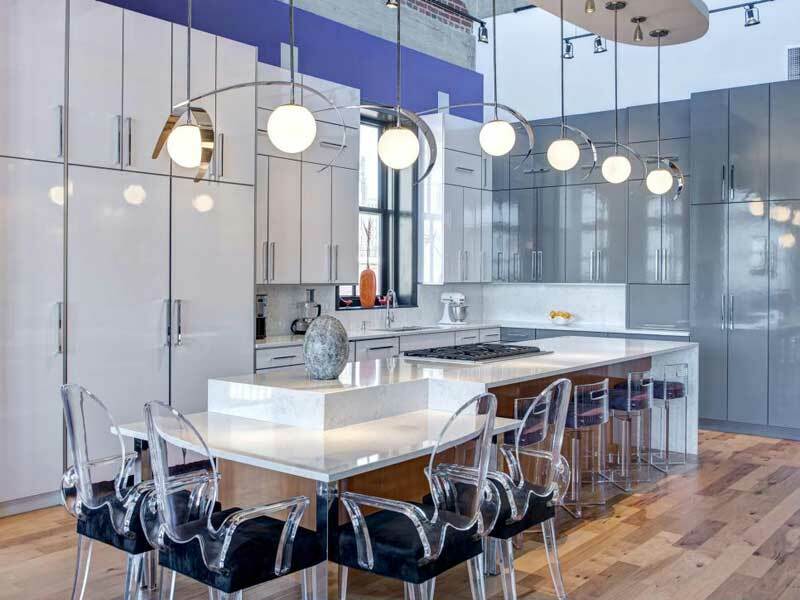 It features two eye-catching spherical chandeliers above the kitchen island, which boasts a gray and white marble countertops blending in with the rest of the kitchen. There are also white glass front cabinets combined with a white herringbone backsplash. In the case, you have a small kitchen, but want to make it look bigger, you should consider this option. 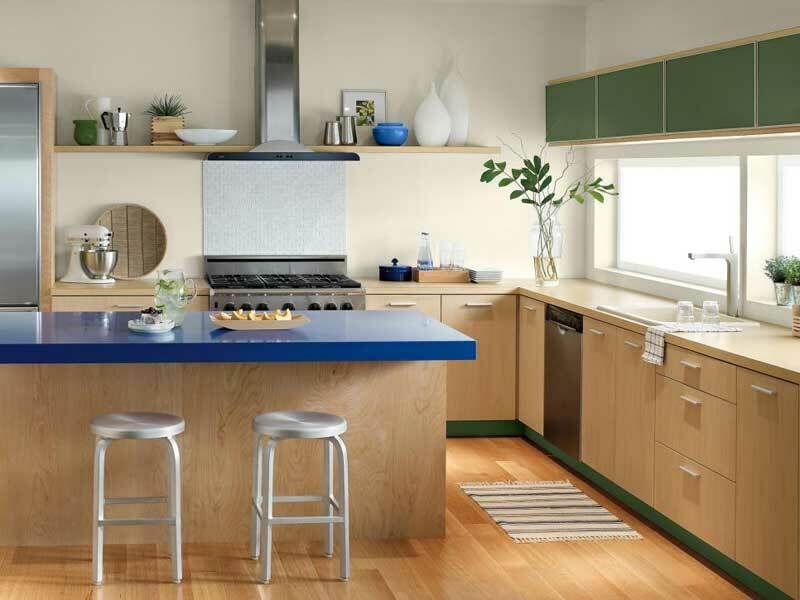 The designer-selected gray cabinet facings and blue-hued tile to make the room look more spacious.The large peninsula provides a full workspace for you in the chef role. This simple lightwood kitchen gets a new kick with a gray stone counter top. It’s small but super organized and has a chic edge to it. This is modern, but still a warm kitchen design. What gives this fantastic kitchen look is definitely the blonde cabinetry, combined with the green-hued granite countertops and a unique-shaped eat-in island. The green details play a significant role in the ambient making it fun and pleasant. 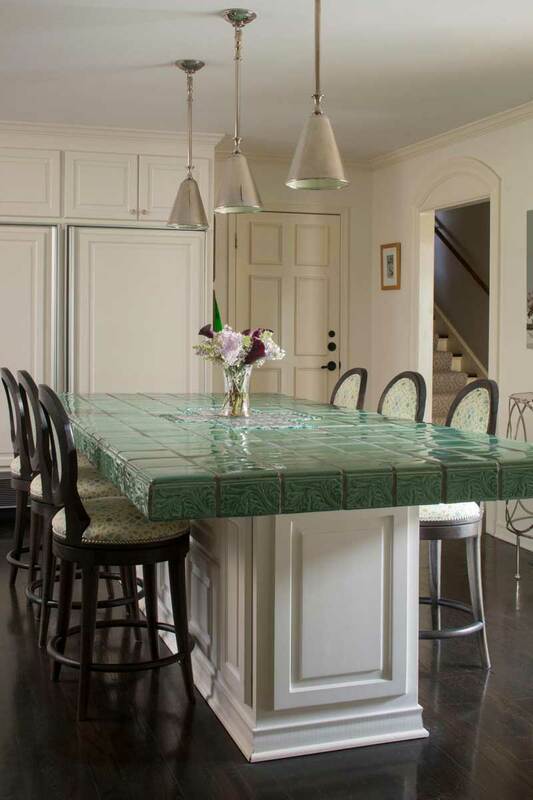 What makes this kitchen simple but stylish is a large island with a beautiful green tile countertop. The island gives this kitchen a splash of color and style to this white and bright space, making a really powerful impact. This custom white kitchen is the example how little details can make an ambient fun and classy. In this case, those details are the eye-catching details, such as an extra wide crown molding, nickel-plated farmhouse sink, fabric roller shades, glass-front cabinet doors and honed countertops. Let’s visit the nd see how their kitchens look like. 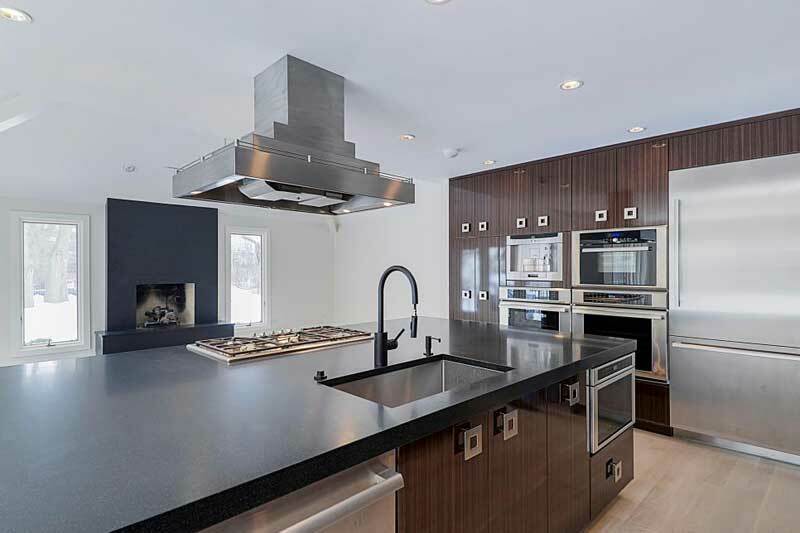 This state-of-the-art kitchen has a long chef’s workspace with countertops made of polished volcanic lava stone, subdued chandelier and high-end cabinetry. Have you a large family with a large list of requirements? Here is something for you. 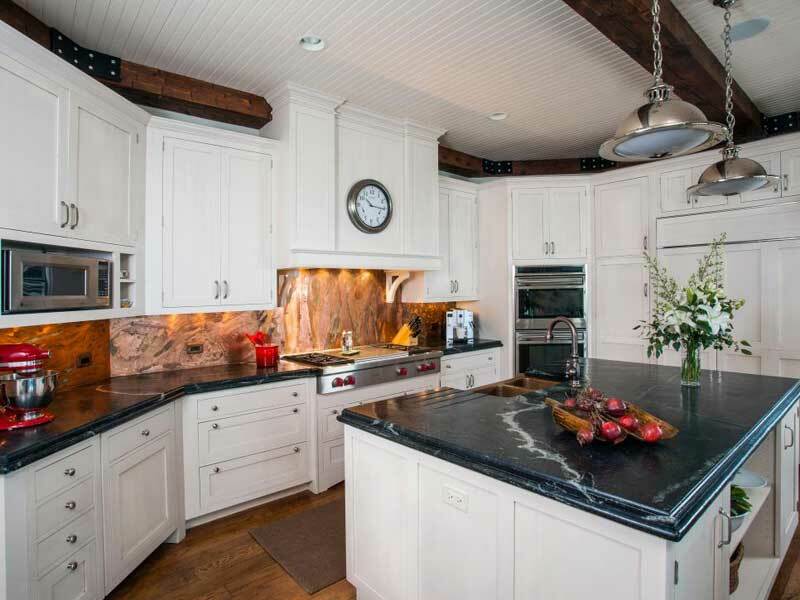 This kitchen offers a large limestone island with hidden USB ports and charging stations and is ideal a large family. What makes space look even bigger and brighter are the Beckwith Interiors. What contributes to that effect are the reclaimed wood shelving and trim, a glass backsplash behind the stove and white shaker cabinetry, to blend the modern and rustic styles the homeowners love. Pretty unusual and creative, right? 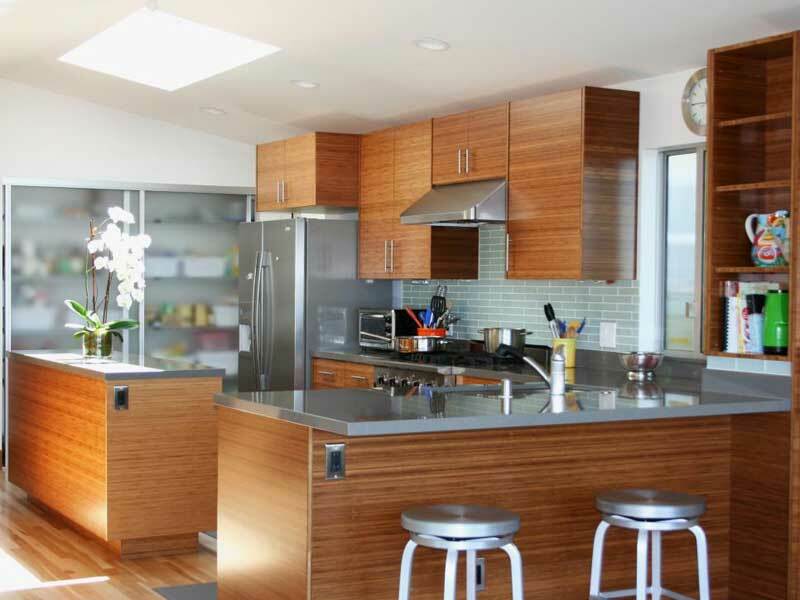 The most attractive part of this kitchen is the island with a live-edge walnut countertop. The rustic effect is made with the trim of the range hood, giving the warmth to the steel-paneled appliances. Wide, bright and sophisticated. This effect is produced by charming marble countertops and chrome pendant lights. 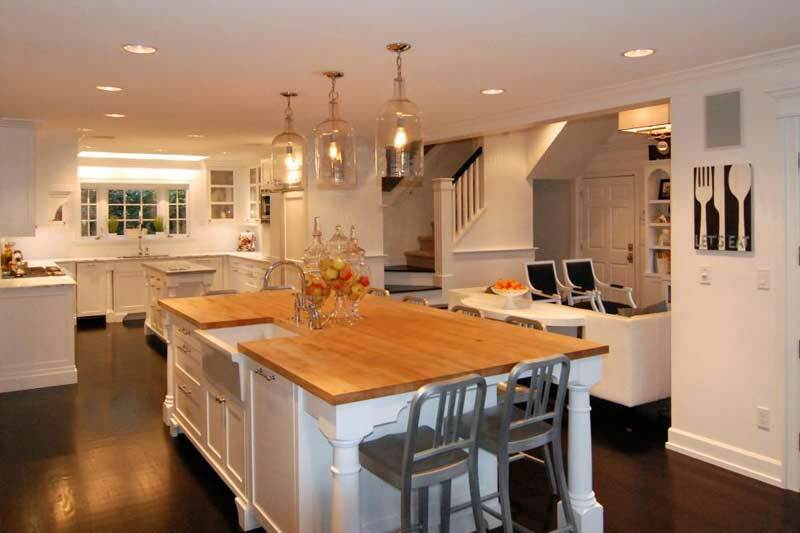 Thanks to the two kitchen islands there is a lot of counter space and room for extra seating. More airy feeling and bright space? 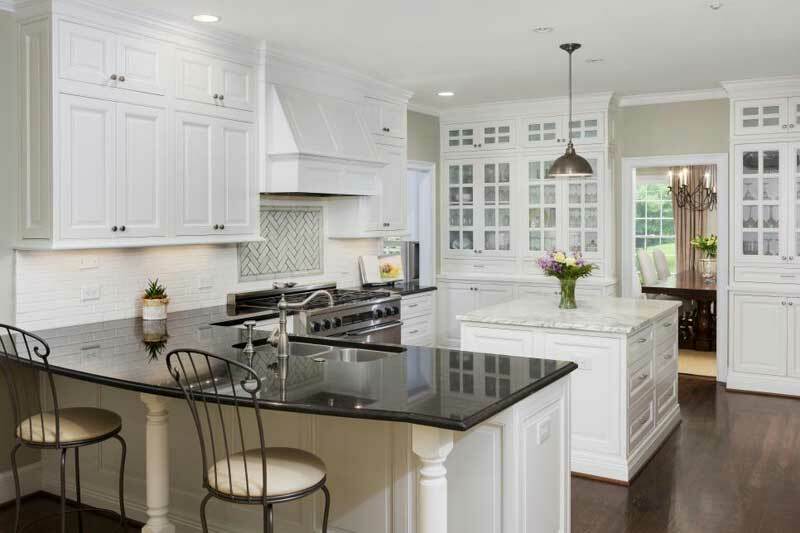 Here we have soft cream walls and white shaker-style cabinets that bring a light and airy feel to this kitchen. A bold, red rug adds a splash of color to the palette. 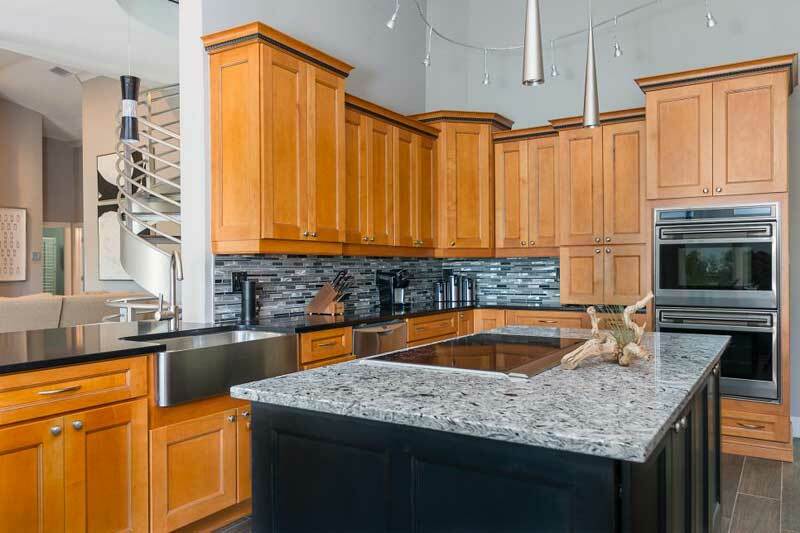 The finishing touches to the design are the granite countertops and sleek, stainless steel appliances and fixtures. 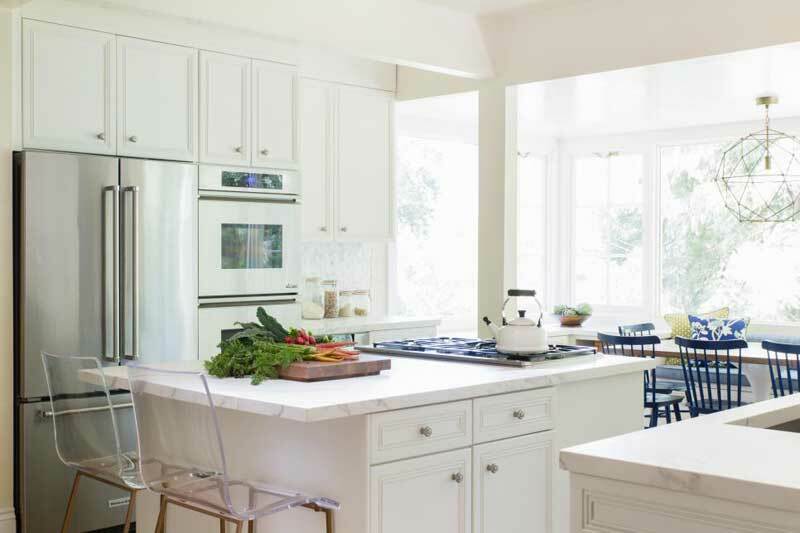 This kitchen’s simple white cabinetry is upgraded with the beautiful porcelain countertop. Though small this kitchen has a practical prep space and a lot of plenty of storage space. The transparent kitchen chairs give this room a modern breath. Are you ready for a little contrast? 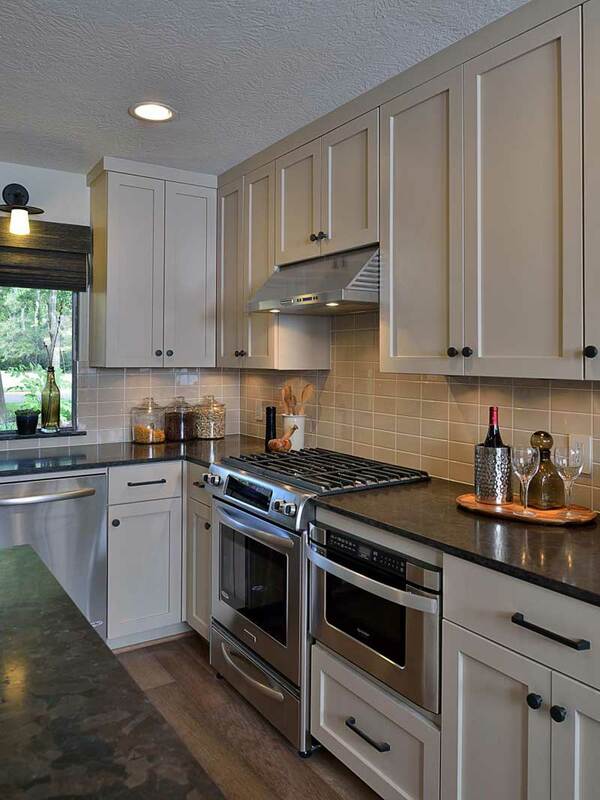 You can achieve it easily by putting together dark cabinets with white quartz countertops. The white subway tile and spring-green wall paint give the space a cleaner and a fresher appearance. Here is something for disciplined, serious tempers. 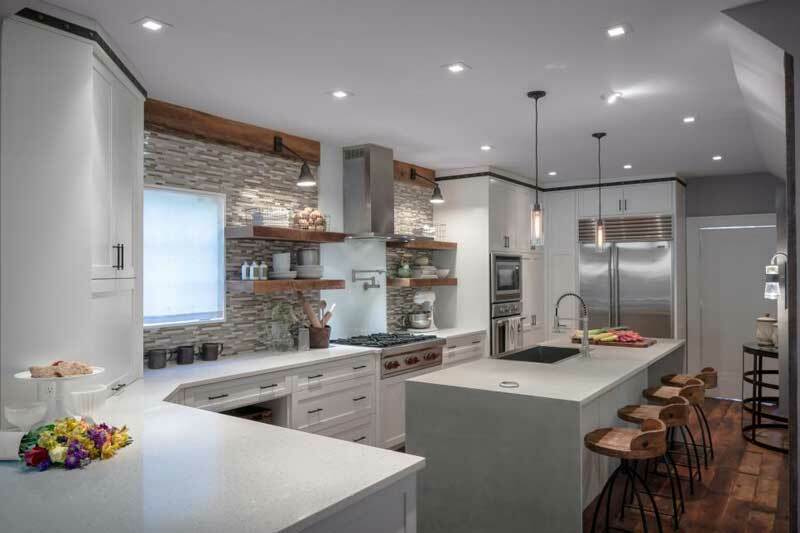 You can see the combination of stainless steel appliances, custom concrete floors and exposed ductwork that give an industrial edge to this kitchen. 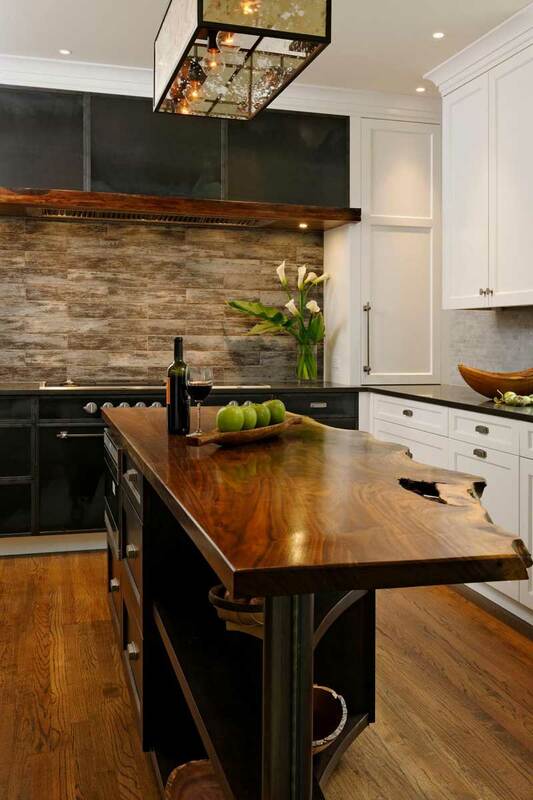 One interesting material used for the island countertop in a welcome point of contrast is the reclaimed wood. For fans of ecology and natural environment here is a kitchen made of materials like a fly ash or recycled paper. 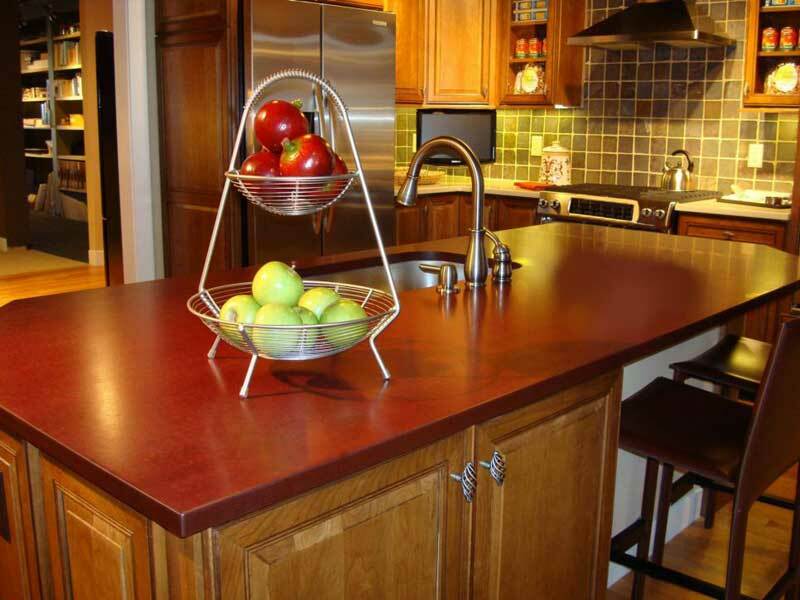 The composite countertops inhibit the growth of bacteria and resist stains, scratches, and heat. Most of them are free of VOCs, emit no radon gasses, and are considered food safe. This is a good example how home space can be used in an efficient and creative way. 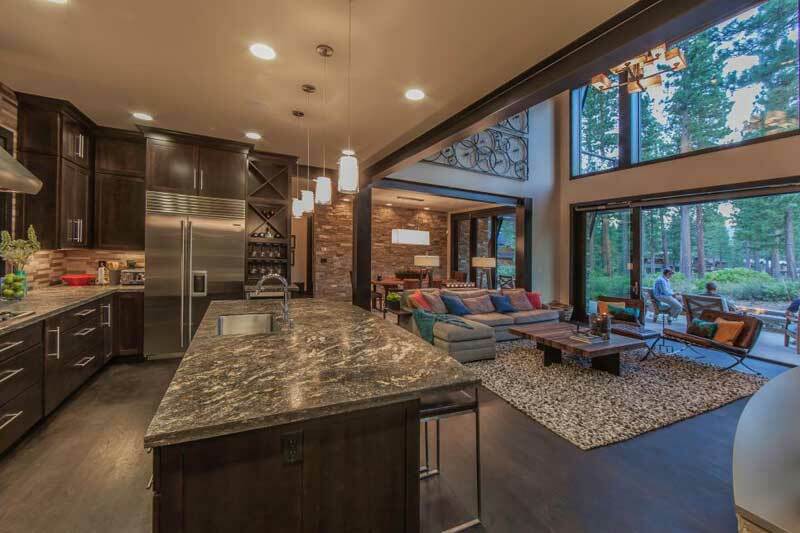 The open staircase and smooth waterfall countertop are details that can make a space like this really fabulous. Simplicity is never old fashioned. 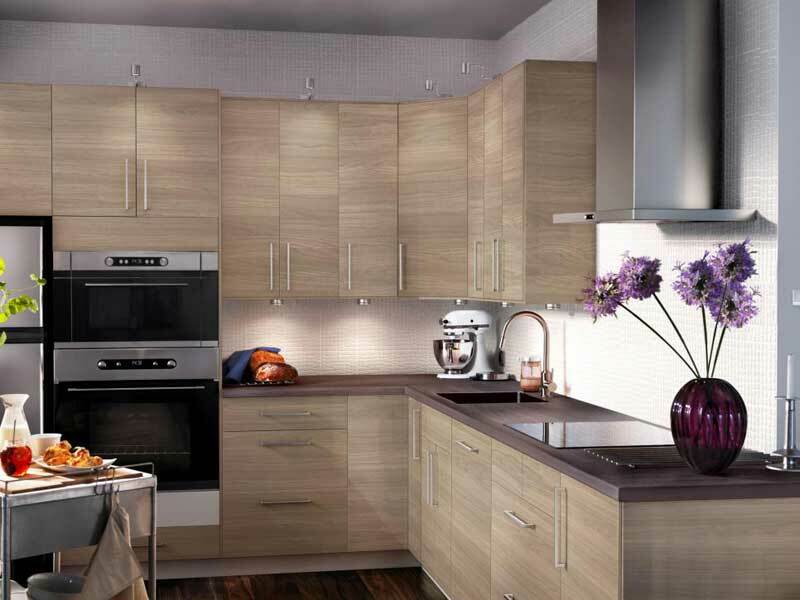 You can easily get it with sleek cabinets in a neutral wood-grain finish and built-in mini spotlights. In addition to this design get a solid surface countertops, sculptural range hood and paint your walls in a soft gray color. Something refreshing again! The combination of stainless steel countertops and appliances contribute to a fresh, industrial contrast against the rich wood finish of the cabinets in this modern kitchen design. To get the better looking effect, a hint of cool color is introduced with the pale blue backsplash. 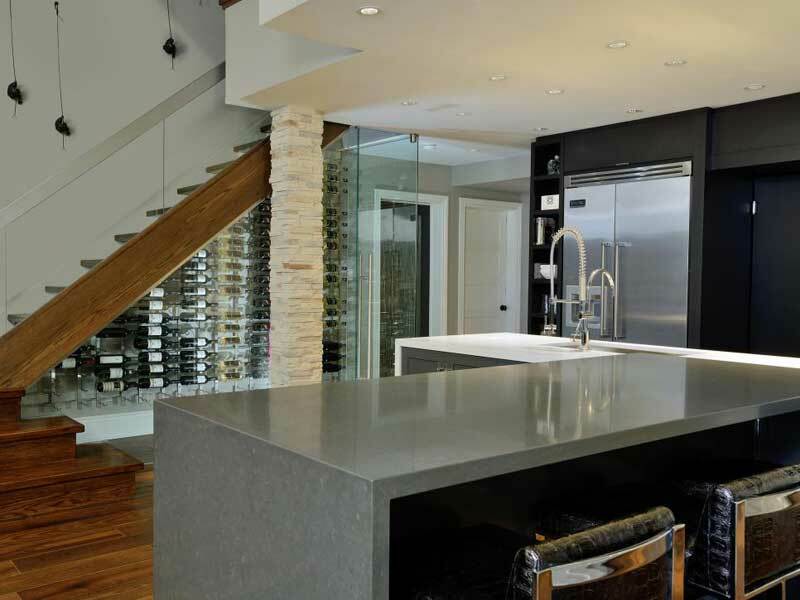 Another way to get a sophisticated looking kitchen is to combine modern stainless steel appliances with stone countertops and dark shaker style cabinetry. It is perfect if you have a spacious room, and you can walk right in from the sliding glass doors and take a seat at the large kitchen island. A modern look doesn’t have to be cold. 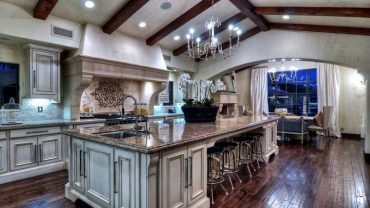 Here is a combination of a large island with a thick and a clean-lined countertop that offers plenty of room for preparatory work. One more detail that could be exciting is a sleek black fireplace outside the kitchen, which warms up space and makes it perfect for after party drinks. 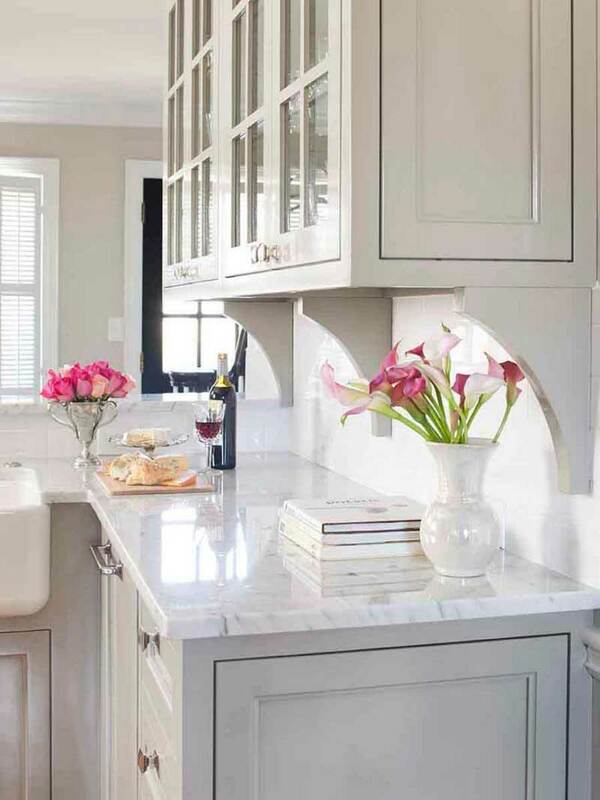 An elegant, simple and light kitchen can be made by combining a marble countertop with beautiful glass-front cabinets and a white farmhouse sink. Adding a couple of discrete details like vases will produce enough contrast to make this part of your home appealing and pleasant. This modern, different and classy design can be achieved with a quartz kitchen countertops design, combined with high-gloss cabinetry, giving this kitchen a clean and crisp look. Transparent kitchen chairs and barstools are also a great contribution to this modern design. 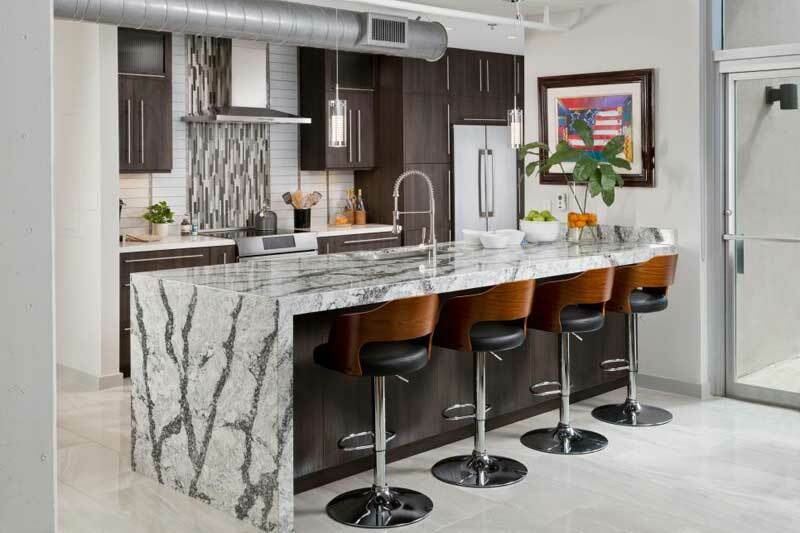 A beautiful combination of thick marble countertops with bold gray marbling covers at the top of the eat-in bar space in this kitchen. The stylish bar stools with wooden backs and black seat cushions contribute to the overall look of this unusual design. After so many straight lines, it’s turning for little curves. 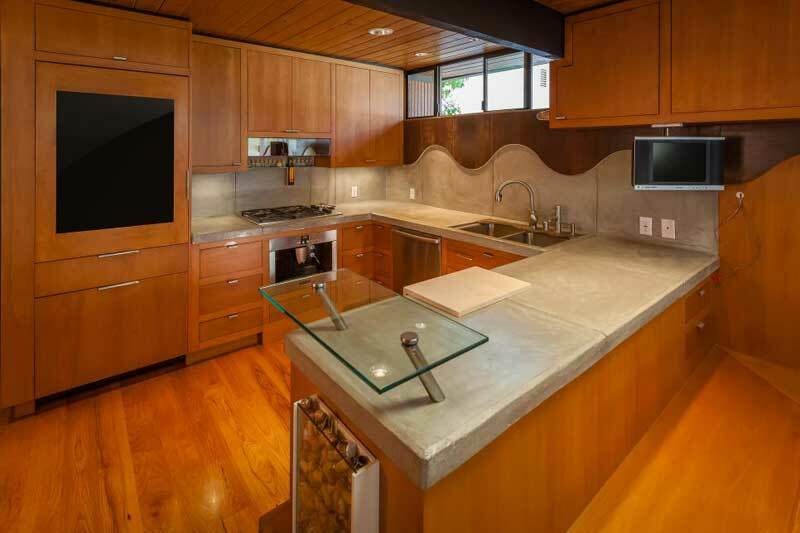 They can be achieved with a countertops in retro kitchen highlighted by a rounded edge, eliminating painful encounters with pointy corners. The black tile trim adds up to the retro atmosphere in this space with modern features. 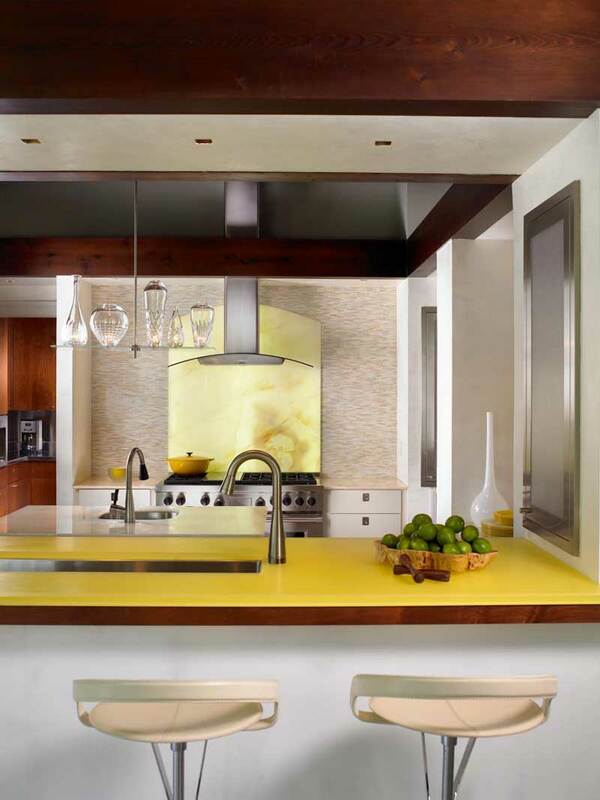 This bold kitchen design is marked by the grand kitchen island covered with a yellow countertop. What would otherwise be beautiful but a simpler design is uplifted by the interesting choice of color when it comes to the countertops.